The Conservatives are attempting to shift the election battleground to the economy with an attack on Labour's tax and spending plans. The Tories claimed Labour's spending plans to date amounted to a £45bn "bombshell" for workers and families. But shadow chancellor John McDonnell said its plans were fully costed and dismissed their opponents' calculations as "absolute lies". Parliament has now been dissolved ahead of the 8 June general election. It means every seat in the House of Commons has become vacant and there are no MPs until a new Parliament is elected. However, government ministers retain their roles and continue their work. Mrs May is expected to be driven the short distance from 10 Downing Street to Buckingham Palace for an audience with the Queen. The parties have not yet released their election manifestos, but their taxation plans have already come under the spotlight, with Prime Minister Theresa May refusing to repeat her party's 2015 "tax lock guarantee" - while promising there would be no increase in VAT. The Tories have now turned their fire on Labour's plans with an attack poster claiming Labour's commitments to date amount to a tax "bombshell", which they say "don't stack up". Media captionJohn McDonnell, the shadow chancellor, attacks the BBC on Today for reporting "Tory lies"
Labour, which is promising to suspend the closure of hospital services across England, has already pledged to appoint an extra 10,000 police officers and increase NHS workers' pay, and it also plans to borrow to invest extra money in infrastructure. 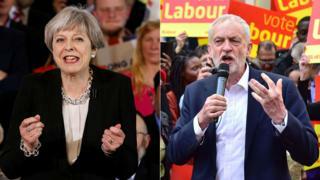 The Conservatives have also included costings from other announcements, speeches and interviews made by party figures dating back to Jeremy Corbyn's 2015 leadership campaign, as well as proposed revenue raisers such as Labour's planned corporation tax increase. Brexit Secretary David Davis said: "Jeremy Corbyn's nonsensical and irresponsible ideas pose a grave risk to the future of Britain's economy and the finances of every family in the country. "His many, ill-thought through promises simply don't stack up and could not be paid for." On Sunday Mrs May said she had "absolutely no plans" to increase taxes, and that a Conservative government would not raise VAT if she won the general election. 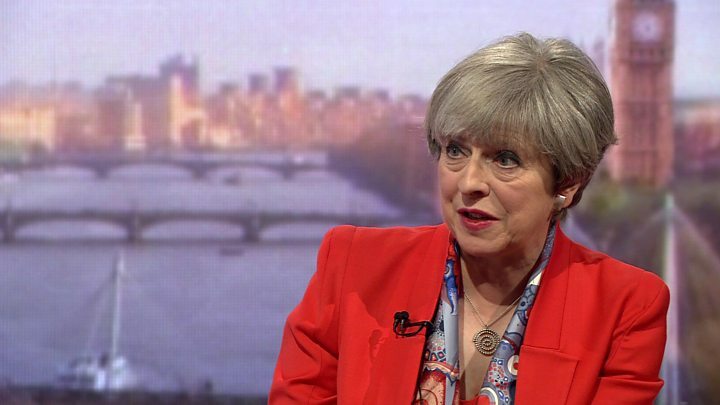 But she did not back predecessor David Cameron's pledge which also ruled out rises in income tax and National Insurance until 2020. Labour has also said it will not raise VAT, and has promised low taxes for what it calls "low and medium earners". It has also said it will increase corporation tax and reverse capital gains and inheritance tax cuts, which will pay for the majority of its spending commitments. The party's campaign manager Andrew Gwynne accused the Conservatives of "blatantly misrepresenting" their plans. The Tories, he said, had included more than £2bn in pledges that were not current party policy, such as subsidised nursery provision for all children, increased benefits for the over-25s, buying out all private NHS contracts and reversing all cuts to arts funding. Plans to increase the carers allowance, reinstate bursaries for trainee nurses, restore the educational maintenance allowance and scrap maintenance loans for students, replacing them with grants, were all fully funded, he said. 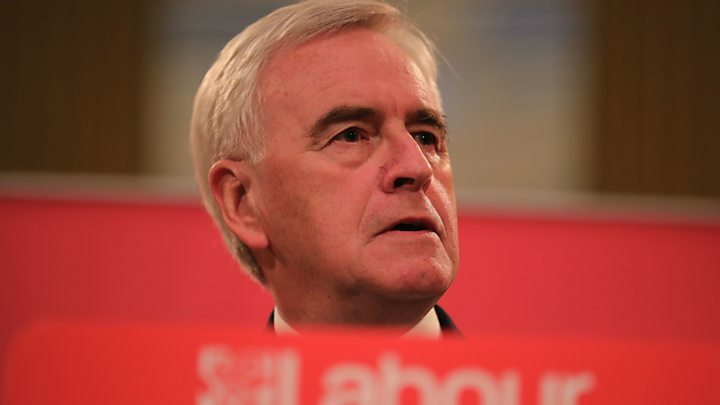 Mr McDonnell said the Conservatives' "desperate" attacks were designed to divert attention from the fact that they were not themselves ruling out increasing tax on low and middle-income earners. "To be frank, in common parlance, people would call these, what the Tories have published today lies, absolute lies," he told BBC Radio 4's Today. Labour is returning to the NHS with its campaign on Wednesday, promising to suspend local reform plans involving closures to A&E, maternity and stroke units. It said the process was causing confusion and risked being driven by money rather than what was best for patients. But the Conservatives dismissed the idea and said funding was in place to pay for the changes.